Prep rugby • Highland coach stressed family, responsibility in legendary 36-year career. Djamila Grossman | The Salt Lake Tribune Highland coach Larry Gelwix cheers as his team scores in a game against United in the Rugby Championship game at Rio Tinto Stadium in Sandy, Utah, on Saturday, May 21, 2011. Highland won the game, which was Gelwix's last with the team. Djamila Grossman | The Salt Lake Tribune Highland rugby players celebrate after winning against United in the Rugby Championship game at Rio Tinto Stadium in Sandy, Utah, on Saturday, May 21, 2011. Djamila Grossman | The Salt Lake Tribune Highland coach Larry Gelwix cheers on his team in a game against United in the Rugby Championship game at Rio Tinto Stadium in Sandy, Utah, on Saturday, May 21, 2011. Highland won the game, which was Gelwix's last with the team. 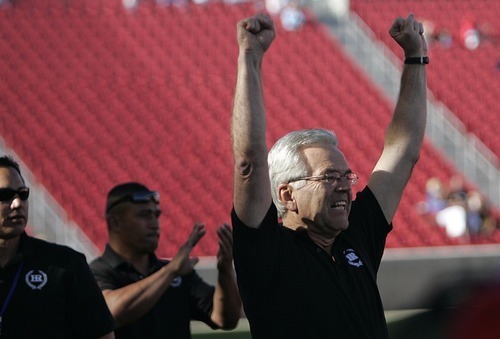 The Utah rugby community is a bit resistant to say ing goodbye to legendary coach Larry Gelwix. "They asked if I could coach next season by Skype," joked Gelwix, who has led Highland's storied rugby team for 36 years. "But I said I just don't think so." Gelwix, who is retiring as coach to serve an LDS Church mission in Fresno, Calif., leaves the team at the top of its game. Highland earned its 20th national championship last month by beating Utah United 38-24 at Rio Tinto Stadium. During his tenure, Gelwix changed the landscape of the sport. Rugby was relatively unheard of when he organized the Highland team in 1975  only six players showed up to try out. Today, there are approximately 3,500 high-school-age boys who play in the greater Salt Lake area. Highland has been the only team in the nation to qualify every year for the USA National Rugby Championship Tournament since its inception in 1985, and has won 18 titles. Most notably, Gelwix led Highland to an improbable 1998 World Schools Rugby Championship bronze medal finish in Harare, Zimbabwe. But for those who have played for him, Gelwix's influence can't be measured in trophies. The coach created a sense of family among his teams. "Our whole team is held together that way," says Bingham senior Kesni Tausinga, who has played three years under Gelwix and has a scholarship to play football at BYU this fall. "That team bond is incomparable to any other team I've played on." Highland rugby alum and current Utah football safeties coach Morgan Scalley says that it was always about much more than rugby for Gelwix. "Larry made us a feel like a family. He was always about the person, not the athlete," Scalley said. "It's important to know that your coach cares about you, your family, your grades, and whatever else you have going on." Haloti Ngata played for Gelwix as prop and lock from 1999 to 2002. He went on to play college football at the University of Oregon and was eventually drafted by the NFL's Baltimore Ravens in 2006. Ngata is one of the top defensive linemen in the NFL and he credits Gelwix for helping him achieve success. "He taught me that I can't settle for good," Ngata said. "Good is the worst enemy of the best. I never understood that until I played for Larry. He showed me how to drive myself to become the best." Among the many lessons that Gelwix has instilled in the players, Tausinga believes that the accountability he learned from him will follow him into his football career at BYU. "He's taught me to just man-up and take responsibility for my actions on and off the field," Tausinga said. "He always says, 'You can choose what you do, but you can't choose the consequences.' "
Gelwix says he will return to the game once he is back from his mission. "I will stay involved in rugby, but in what role, I don't know," says Gelwix. He adds, however, that "I'm not planning to come back and coach the team." That role has been passed on to Haloti Liava'a, the team's associate head coach since 1994. Liava'a knows he has some very large shoes to fill. "I just want to continue Larry's legacy," says Liava'a, who has adopted a coaching style similar to Gelwix's. 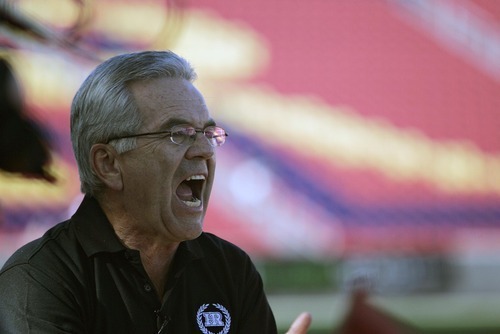 "We don't yell like your standard, stereotypical football coaches. We don't have to. When the boys come out to play for us, the expectation of hard work is already there." Liava'a is taking over coaching responsibilities at a precarious time. It is rumored USA Rugby may soon eliminate the Under 19 division, the program to which both Gelwix and Liava'a have devoted the majority of their time. If that happens, Liava'a says he would like to restructure his program to accommodate as many players as possible. Like Gelwix, Liava'a says his first priority is the players. "Our job is to bring these boys together from all different backgrounds and help them bond. It's about inspiring them." • Larry Gelwix played rugby for BYU for three years under coaches from New Zealand. • After briefly coaching the Highland High football team, Gelwix decided to organize a rugby team for the school in 1976. • Gelwix has led the Highland rugby team to the national championship tournament every year since its creation in 1985, winning the title 20 times. • Highland maintains a near perfect varsity record of 418 wins and only 10 losses.